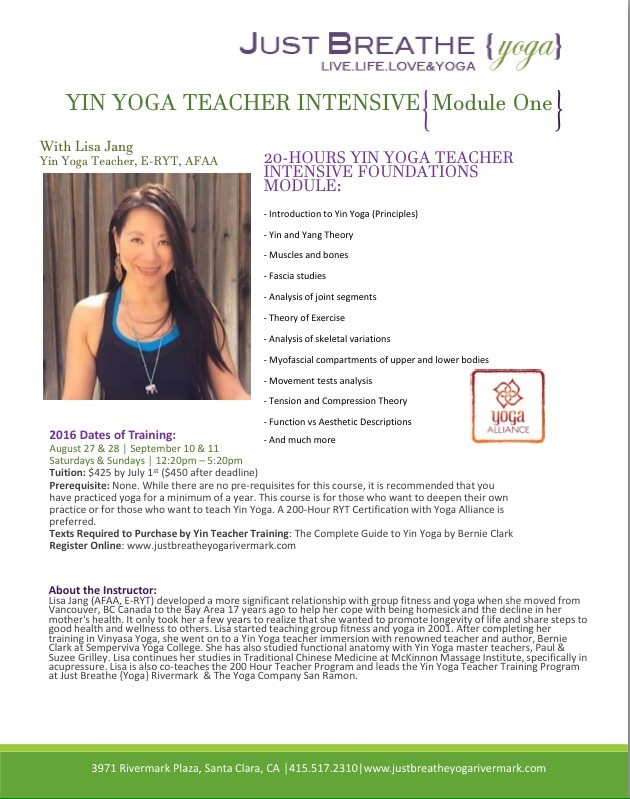 Yin Yoga South Bay Immersion coming soon! Yin Yoga is such an amazing practice that takes you to another kinestic awareness. I’m so happy to announce I will be teaching Yin Yoga 20-Hour Module at Just Breathe Yoga Rivermark in August. Register early, this training will sell out quickly. Yin Yoga 60-Minutes (Members Only) April 27, 2019 at 8:30 am – 9:30 am Crunch - Blackhawk, 3464 Blackhawk Plaza Cir, Danville, CA 94506, USA Access available to members and guests. Drop ins with fee. Yin Yoga 75-Minutes (Drop-ins, Guests and Members) April 28, 2019 at 5:00 pm – 6:15 pm Joya Yoga San Ramon Register online at www.joyayoga.com Packages and class passes available. Les Mills BodyFlow(r) 60 Minutes April 30, 2019 at 10:00 am – 11:00 am 24 Hour Fitness, 4450 Norris Canyon Rd, San Ramon, CA 94583, USA 24 Hour Fitness All-Club or San Ramon Club access members. Drop-in fees for non-members. Go online at www.24hourfitness.com for a free guest pass. Vinyasa All Levels 60-Minutes (Members & Drop-ins) May 1, 2019 at 10:00 am – 11:00 am 24 Hour Fitness, 4450 Norris Canyon Rd, San Ramon, CA 94583, USA Please arrive early and get your pass. This class runs out of passes 10-15 minutes prior to class.